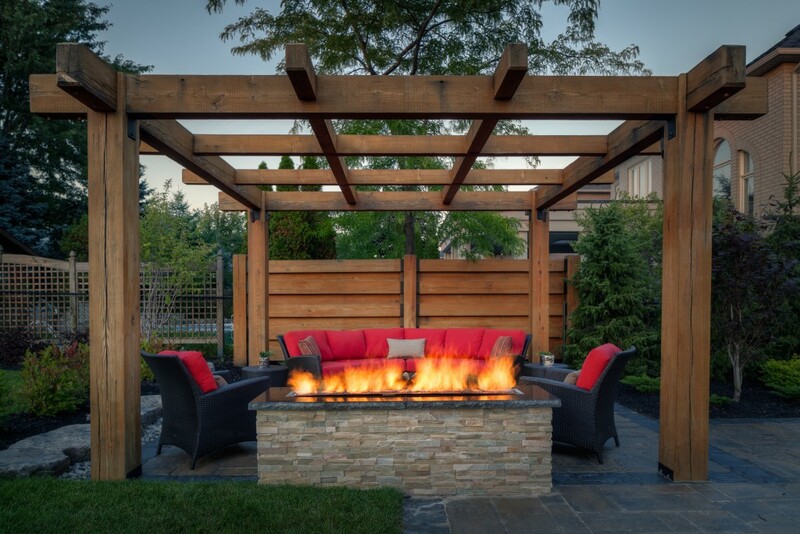 Outdoor structures from fire features to gazebos to water features and outdoor kitchens can completely transform the outdoor area to a stylish, modern and even sophisticated setting that is just as cozy as the indoors. 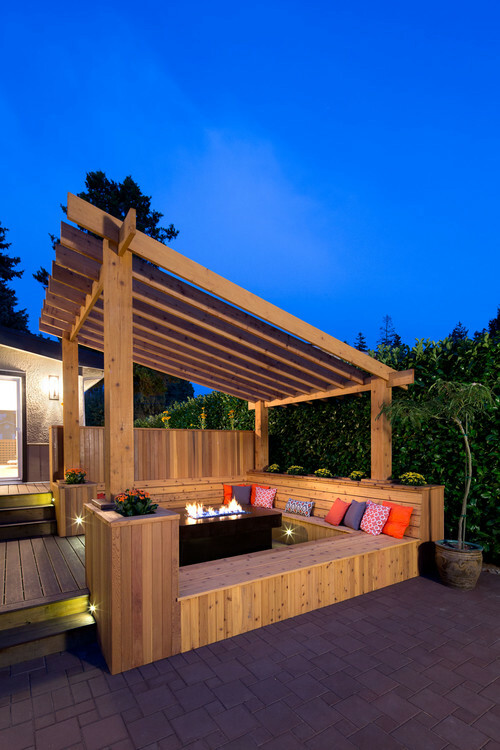 One of the best ways to transform an ordinary outdoor area into something eye catching and fun is to incorporate a pergola with your fire pit. 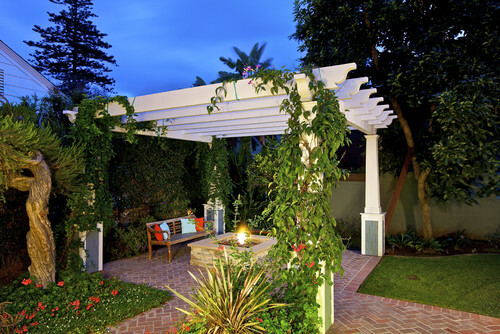 A Pergola is an outdoor structure mostly with four posts that act as anchors into the ground. The the defining characteristic of a pergola however is the roof, which is typically open and consists of flat horizontal planks of wood. 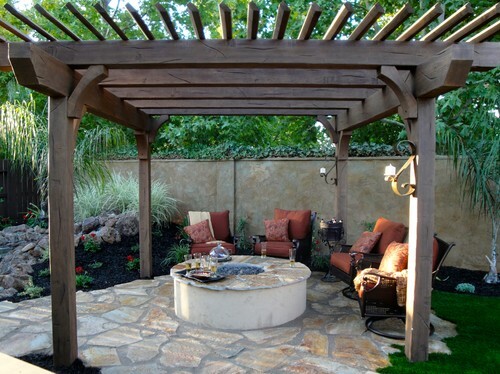 Therefore, because they don’t have a full roof, pergolas only provide shade but cannot offer protection from rain which means that the fire pit will need to have a fire pit cover or lid if its a permanent fixture. 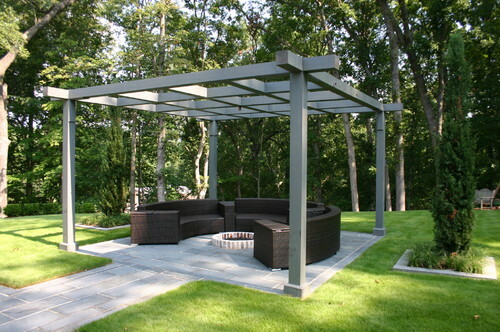 Pergolas are often mistaken with gazebos but unlike pergolas, gazebos are usually like small complete rooms in the yard. What sets them apart from pergolas is the doom shape of the roof. Their roofs are usually octagonal creating a kind of dome shape and usually have a complete roof cover. 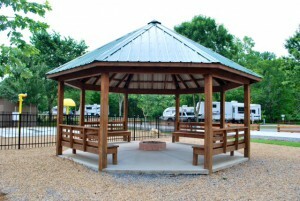 Therefore, a gazebo will provide total protection to your fire pit against all weather elements. To create an area where you can enjoy the outdoors and relax as you get warm and roast by the fire. To create an additional area where you can entertain family and friends. To enhance the visual appeal of your outdoor area with a design element that will will be an outdoor centerpiece. 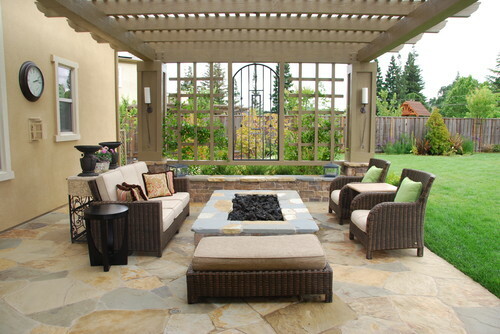 A fire pit with a pergola will improve the value of a home in case you want to sell. Examples of outdoor fire pits under a pergola. 2. This outdoor area is a creation by Erin from Sunny Side Up Blog who designed this cozy fire pit area from scratch complete with a sitting area sufficient enough to accommodate quite a few people. 4. There is nothing like enjoying the cool fresh air surrounded by green refuge and flowers. 5. Everything wood except for the bench pillows. Just a great fire pit under a pergola for a perfect scenery. 6. A modern back yard oasis nestled between greenery with lounging area complete with a fire pit under a contemporary pergola. The seating chairs provide a great contrast against all that green. 7. This designs looks so inviting, after a day long day of work, cool place to just relax and enjoy a glass of wine. From the above pictures, it is obvious that with a little design, a simply designed pergola with a fire pit can be used to bring the cozy indoors out.